A web browser is the software used to download and display web pages on your computer. A web browser can communicate with a web server using the http protocol to download the pages you request, usually by clicking on a hyperlink. A browser can translate HTML, the language used to create web pages, into the content you see displayed in the browser window. For most of the history of the Web, the major web browsers were Internet Explorer, which is installed by default with the Microsoft Windows operating system, and Netscape Navigator, a free download. In the early days of the Web, it was common for each browser to add features that were not supported by the competition. This led to a “browser war” that made it difficult for web designers to develop pages that would display the same way on all browsers. In recent years, Internet Explorer has emerged as the dominant browser because it is bundled with Microsoft Windows, and the browser wars are no longer as much of an issue. However, as a result of a lawsuit against Microsoft, the creator of Internet Explorer, Windows users can now set any browser as their default application for opening and displaying web pages. This decision opened the door for other browsers to challenge Internet Explorer’s dominance. 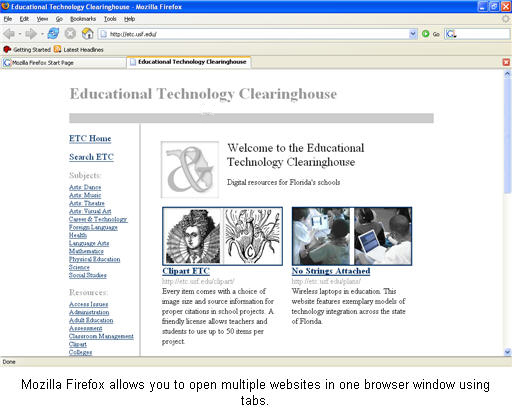 More recently, Netscape has been replaced by Mozilla Firefox as the most popular alternative to Internet Explorer. Firefox is a free browser that can be downloaded from the website for the Mozilla Foundation. Another popular web browser is Opera. Originally available only as either a paid version or an ad supported free version, Opera is now available as a free download that does not display ads.